This week’s episode spent about ¾ of its time chipping away at Carol. And it was time very well spent. Her history, how she’s dealt with recent losses and where her mind is right now. There are some very short but useful flashbacks to specific moments in Carol’s recent history. Driving away from Rick, burying the girls with Tyrese, burning two people in the prison. There was a line Carol said that I loved. While watching out a window with Daryl she explains that early on, with her husband Ed, she would pray for things to happen but would never do anything. That person was burnt up. Then at the prison she could fend for herself and became a leader. Then that person was burnt up. Now she didn’t know who she was. 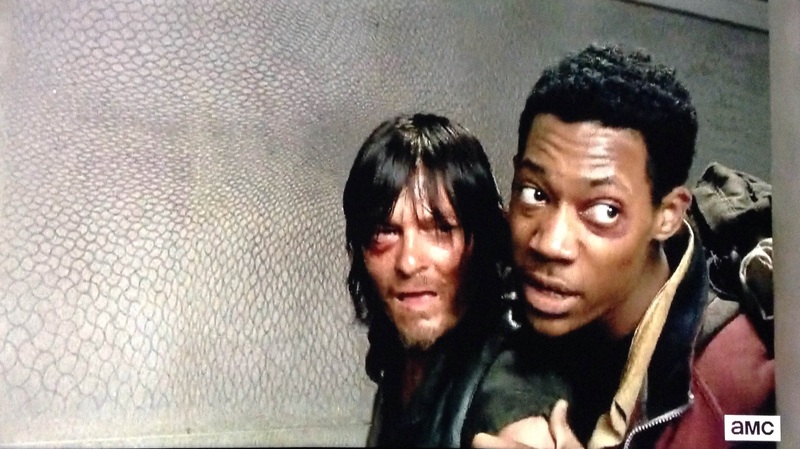 Daryl provides the proverbial slap to the face with, “we ain’t ashes.” Point, Daryl. 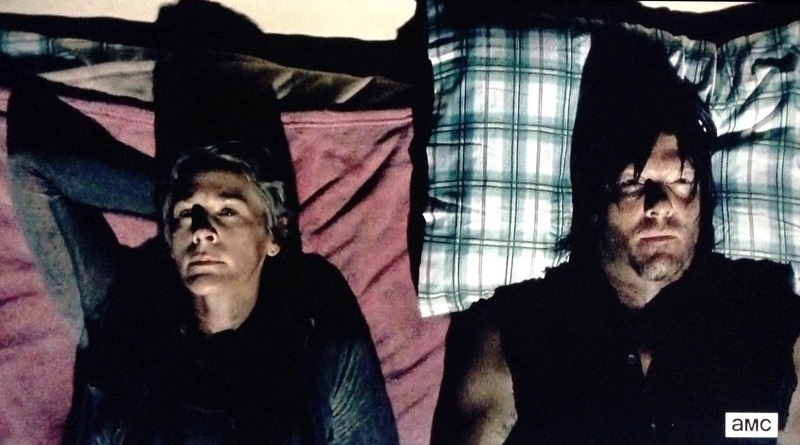 It seemed a near foregone conclusion after “Slabtown” that it was most likely Noah with Daryl in the woods. 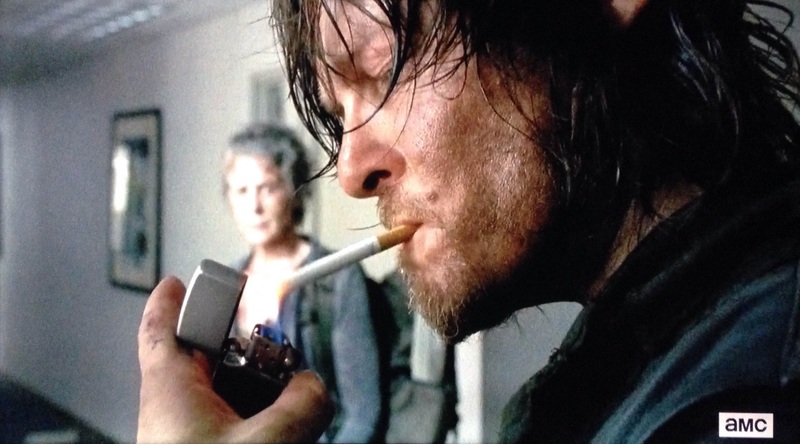 That’s confirmed (not visually, but presumably) by the end of “Consumed”, but not before he gets the jump on both Daryl and Carol. You read that right. Noah, of all people, got the jump on our dynamic duo. You had to know that chain-locked doorway would be trouble. Noah gets away with a rifle and the crossbow, but it’s not so easy when he runs into them later. The major theme from season four was all about coming back. We saw traces of that reappearing with Carol when she talked about starting over. At the beginning of the episode Carol seems to think this quest to find Beth is worthless. She doesn’t think they get to save people in this world. But by the end she’s sticking around to save Noah. It’s not necessarily that she’s changed, just that she’s trying. She’s trying because she sees how things are and things she’s having to do, and she recognizes that’s not how it should be. There is a belief among some naturalistic philosophers that we determine our own morality as societies, then put those ideas in play so that, in general, the way things are is the way they should be. This however is a fallacy, and it’s one that Carol’s senses tell her isn’t right. Also known as “Hume’s law”, you can summarize this by saying, “you cannot derive as ‘ought’ from an ‘is’”. Just because things are a certain way, doesn’t mean that’s how they ought to be. Carol senses this. She feels her morality slipping away. She’s not sure who she is anymore, but she can decide to try and be the person she knows she should be. That’s the person who, in the end, wants to help Noah rather than leave him be. Kudos to Daryl for bringing this out. He makes her choose when they run into Noah again. 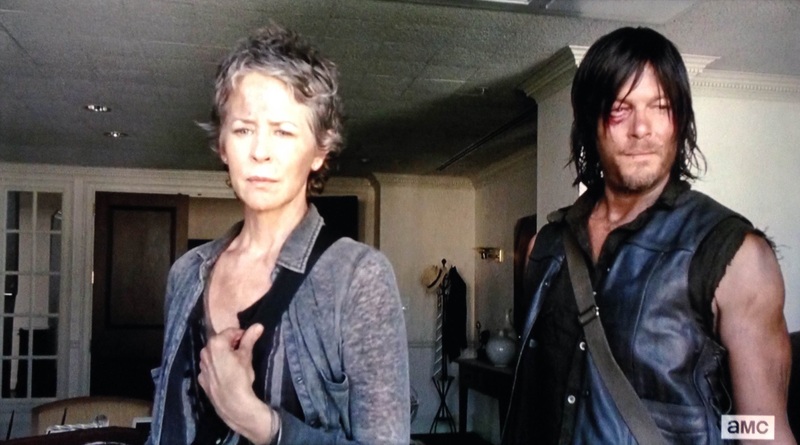 He decides to leave him, but Carol wants to help. Daryl pushes the issue and walks away. This isn’t just Daryl being hard, it’s Daryl testing Carol. Making her choose whether to try, or whether to ignore that sense of good that still flickers within her. Good thing to. Saving Noah resulted in learning exactly where Beth is located. We wrap up with a bit of a frantic run onto the streets when they believe the officers from Grady Hospital are onto them. They’re no doubt out looking for Noah as these events follow very closely after his escape. In the frenzy, Carol gets ahead of Daryl and Noah and runs into the street only to be hit and flipped by one of the officers’ vehicles. Noah convinces Daryl to let them take her and the eventual collision of Rick’s warriors and Dawn’s officers begins to materialize and become imminent. At this point I’m viewing every episode in light of the season premiere, which was one of the best episodes this show has ever delivered. If that’s an ‘A’, then a B+ is pretty darn good. Daryl and Carol are so much more interesting than nearly any character on the show. Their dialogue together was beautiful and deep and meaningful to the story. I could’ve watched another hour of just those two perusing around the city and stopping for an occasional battle of the minds and planning their route. Holding this episode back from ‘A’ territory for me were a couple of implausible decisions. I find it hard to believe that as smart and seasoned as Daryl and Carol are that they could: 1) Get themselves pinned into a van when they see a horde approaching a long way off, 2) that Carol would run out into the road without clearing corners when they had both been doing that previously, and 3) that Noah could actually physically hold Daryl back from running out to Carol. Also, no way that van lands right-side up. Daryl gets the cavalry to retrieve Carol and Beth, but my prediction is what happens when they’re gone. End of show previews for next weeks episode show Carl, Gabriel, Judith and one or two others stay at the church. I think this is the perfect time for Morgan to show up. I don’t know why he’s introduced again in the season opener, following the tree markings, if he doesn’t come into play soon. Carl is in full protection mode while Rick is gone and I think this leads to a very tense and dangerous meetup with Morgan. Carl remembers him as a looney, will he trust him now? Whether it’s Sasha or Tyreese that stay at the church could be the deciding factor in whether caution and composure rule the day. The Trojan horse theory (Carol getting caught to free Beth from inside) has been pretty popular, but I’m not buying into that. Obviously it wasn’t purposeful, but Carol was already limping before she’s hit by the car. Now she surely has a broken leg(s) and likely a concussion. She’s in no shape to free anyone and won’t be for some time. I’ve already predicted she dies, so let me get more specific. I think she’ll eventually sacrifice herself to save Beth when Daryl comes back with Rick and others. Her question of whether they can still save people will be answered poetically in her own actions of sacrificing herself to save Beth. Be prepared to say a heartfelt goodbye to Carol. So what did you think of this episode, and where we go from here? I really enjoyed reading your thoughts on the episode. As for where the show goes from here, it’s very possible we may be losing one or more of our regular cast members soon in the rescue attempt. I see the surviving people reuniting, making their way towards DC and picking up Morgan along the way. Thank you so much! It’s been fun so far looking for some spiritual or moral intricacies in taking a critical view at each episode. I’m inclined to agree with you. We had one major escape from Terminus without losing anyone, which surprised me. I’d be shocked if we have a rescue attempt in the same half-season without losing one or more group members as well. And I also have to believe Morgan comes back in to play real soon. Do you think Abraham and his group make it back to the church in time to join the assault on the hospital? Good question, and I’m not really sure. We’ve seen some of the people in the Hospital but not the full scope of that crew. If I remember correctly Noah mentioned they’ll need some serious firepower. Abraham would be very handy to have in a battle.